Make an informative purchasing decision. Watch the Cana-Vac central vacuum buyers guide. Central Vacuums, has any subject been discussed in as much detail with as little understanding? With the myriad of information available, performance specifications, marketing tactics and misinformation, it is little wonder central vacuums and vacuum cleaners in general are still misunderstood. Our industry has spawned many schools of thought interspersed with facts, myths and legends of what vacuum systems can accomplish. This buyer’s guide is designed to help you navigate this information maze. There are many central vacuum manufacturers, many of which make exaggerated performance claims. In addition, there are many ‘marketing’ devices and definitions used which do not accurately indicate true performance, quality or value. At Cana-Vac, we’ve designed this Buyer’s Guide to help you navigate through this central vacuum information maze. 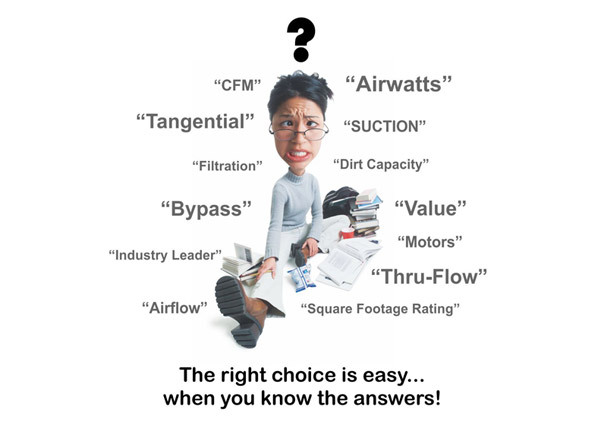 We’ll guide you through the exercise of purchasing a central vacuum system by offering information and insight that’s accurate, informative, and easily understood. Regardless of whether it’s our brand or someone else’s, you will be able to make an educated buying decision and central vacuum comparison.